As Saudi Crown Prince Mohammed bin Salman makes his cross-country tour of the United States this week, debate on the relevance of U.S.-Saudi ties, the feasibility of Saudi social reform, and the legitimacy of U.S. support for military engagement in Yemen may dominate the news cycle. But Americans should also be concerned with the stability of the Saudi economy, considering how closely its trajectory may be linked to that of the U.S. economy. Saudi Arabia and the United States are linked by investment ties, energy markets, and a shared interest in the stability of the global economy. The United States doesn’t really need Saudi oil exports. And in the future, the United States (and the world) will need Middle East oil even less, simply because there is plenty of oil to be found and extracted with new technologies from many other parts of the world, including domestic production of shale oil. BP estimates that there is sufficient oil in current recoverable quantities (as much as 2.6 trillion barrels) to meet current global demand until 2050, twice over. Although the U.S.-Saudi economic relationship is transitioning away from an exchange based on crude oil exports for U.S. dollars, there remain strong connections in energy markets. A case in point: Saudi Aramco is not just a national oil company, but now a global energy company with aims to expand its production cycle to refineries globally and vast petrochemical operations. In fact, the Saudi state-owned firm owns the largest refinery in the United States, in Port Arthur, Texas. Aramco also has the exclusive right to sell Shell-branded gasoline and diesel in Georgia, North Carolina, South Carolina, Virginia, Maryland, the eastern half of Texas, and the majority of Florida. It might not be Saudi oil that is fueling Americans’ cars, but the downstream revenue is going to Saudi Arabia. According to a 2016 Deloitte study, the U.S. Aerospace & Defense (A&D) sector is one of the most significant employers and taxpayers in the U.S. economy. With direct and indirect employment of 4.1 million workers in 2014, spread across the country, the sector paid an estimated $54.3 billion in corporate and individual income-based taxes to local, state, and federal government, and paid $115.6 billion in wages to those directly employed. In 2014, there were nearly 640,000 employees in the top 20 U.S.-based A&D firms. Saudi Arabia is a top customer of the United States and the administration of President Donald J. Trump made early efforts in May 2017 to increase (or at least give the perception of an increase in) contracts for weapons sales to Riyadh. The defense contracting relationship is complicated by how these weapons and equipment are deployed, especially as they are combined with intelligence sharing and advisory roles, as the war in Yemen has demonstrated. Moreover, Saudi Arabia and other Gulf states are more willing than in the past decade to consider alternative defense suppliers, particularly Russia. 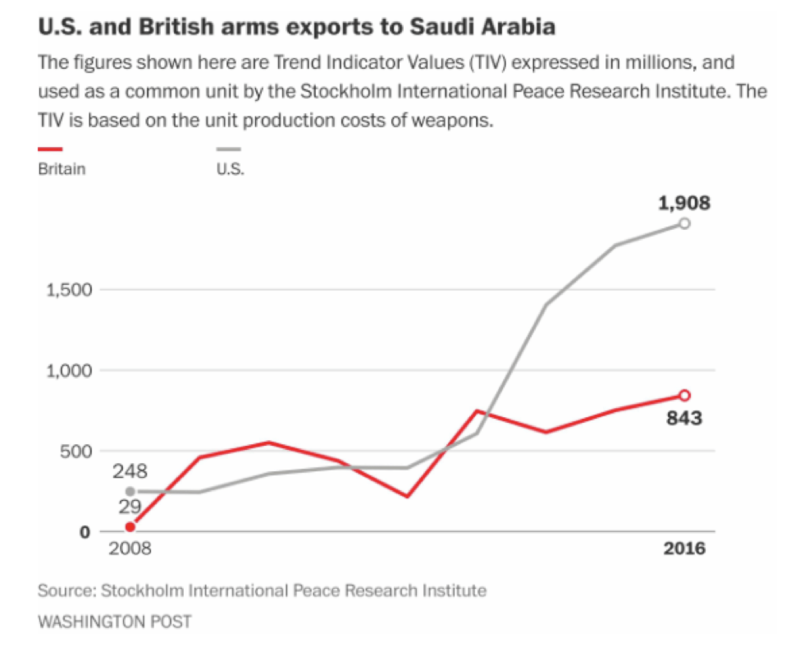 While the threat of an arms purchase from Russia often has been used as a bargaining tool in Saudi arms negotiations with the United States, purchases from Russia are on the rise, as a tool of political leverage and security diversification. But perhaps the most important aspect of U.S.-Saudi economic ties on the current agenda of the crown prince is access to U.S. capital debt markets and equity markets. Saudi Arabia has borrowed nearly $40 billion in international debt markets in the last two years and plans to issue bonds or borrow loans for nearly that much in 2018. U.S. investors and financial institutions will be a large part of that target investor audience. Institutional investors in pension funds and the funds where most Americans place their retirement savings are large buyers of sovereign bonds. For previous Saudi bond issues, investors in Asia have been important buyers of Saudi debt, further linking both the health of the U.S. economy to that of the Gulf, but also to the stability of banks and investors in China, Japan, and South Korea. Moreover, the future of Saudi Arabia’s financial stability is now in the hands of the externally placed investments of its sovereign wealth fund, the Public Investment Fund (PIF), and the Saudi Arabian Monetary Authority, with its foreign reserve holdings. The United States and Saudi Arabia are intricately connected in this way, as Saudi Arabia is a large investor in U.S. companies and debt. The PIF strategy, however, is increasing its appetite for risk. The fund has made some unconventional investments in companies like Uber and Magic Leap. The PIF’s expansion into entertainment, including overtures to Hollywood agencies and production firms like William Morris Endeavor Entertainment LLC, is another departure. While the PIF is not the only sovereign fund taking these steps (Singapore’s GIC and the Canada Pension Plan Investment Board are also investors in Endeavor), the match of Saudi investment to these social media and entertainment firms signal a change in investment strategy and an opening to Western cultural influence. Sovereign wealth funds are like state pension funds, they are the savings of the workers of the public sector, or more accurately, the shared investment of national resource wealth that is public wealth. Their investment strategies are long term, and usually low risk. The Saudi government investment vehicles interested in taking large stakes in U.S. technology firms may be providing some support that would give the U.S. institutional investor market pause. Moreover, abrupt changes in investment strategy from the PIF could easily shake U.S. technology markets in the future. It is also not just the market influence of U.S. technology and social media firms in which Saudi Arabia has invested, but the increasingly political nature of these firms’ operations, which might increase Saudi leverage in U.S. economics and politics in the future. Facebook is a case in point. Its role, and the role of those able to manipulate its data, in the 2016 U.S. presidential election is currently a subject of inquiry. In parallel, any unloading of U.S. Treasury bills by the Saudi government could also have some market consequences. For Saudi Arabia, the kingdom’s monetary policy, in which the Saudi riyal is tied to the U.S. dollar in value, means that continued rate interest hikes by the U.S. Federal Reserve will increasingly put pressure on Saudi foreign reserves and will pass through its banking system in lending rates. For Saudi Arabia, consistency in what is considered property of the ruler and property of the people remains a challenge in its effort to court foreign investors and communicate to a domestic constituency how the reform agenda is intended to meet the needs of the population directly. The saga of the corruption purge continues, in which new detentions and lack of clarity on the state of settlements cloud the government’s messaging to U.S. investors. For some U.S. firms, ties today between Saudi Arabia and the United States in the economic sense are stronger than ever. The rationale is very simple – profit opportunity. There are large U.S. firms, like Goldman Sachs and Blackrock, that are making explicit bets on the Saudi economic transformation, or more accurately, the ability to access and win fees from a number of liberalization and privatization plans. U.S. financial institutions, consultancies, and private investors are poised to make large commitments in Saudi Arabia, and they will expect returns. The visit of the Saudi crown prince to the United States is set to be very long, and could be a difficult logistical journey for his entourage, and more importantly, for his ability to stay on message. Saudi Arabia is clearly courting investors, and also looking to partner with educational institutions like the Massachusetts Institute of Technology and technology clusters to bring some of their expertise and innovation to the kingdom. Saudi Arabia right now is spending more than it is saving. The massive outlays in domestic investment for 2018, as much as $90 billion in capital expenditure outside of the normal budget, are supposed to spur new businesses and new sites of innovation (from the futuristic Neom, to refinery and petrochemical sites like Jazan). Mohammed bin Salman may be on a bit of a spending spree to import technology and systems that will complement economic development within the kingdom. This is good news for U.S. firms and educational institutions. The longer-term relationships will take some care to sustain and for Saudi Arabia to fully absorb any technology transfer and localize its use. U.S.-Saudi economic relations are strong, and growing, but their motivations have traditionally been rather short-sighted: in exchange for oil, defense contracts, and, now, for market access. The growth trajectories are linked and both governments would do well to consider how stable growth meets both of their economic needs. It is also vital to take seriously the nature of shared investments and how Saudi leverage might impact the nature of American innovation. Economic liberalization tends to bring with it social, if not always political, openings. By definition, liberalization challenges existing orders.